Revolutionizing the lighting industry with cutting edge LED technology, the Cree LED Lightbulb package portrays that the recessed lightbulb product inside is “true” light and represents the full color spectrum providing vibrant light. 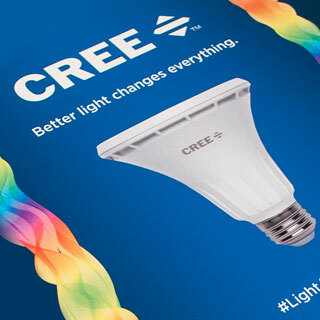 Cree LED lightbulbs pride themselves on being durable, energy efficient and affordable alternatives to the standard lightbulb. The design solution was to generate a higher visibility, much like the lightbulb itself provides, by using rich, saturated colors and rainbow stripes. The package design also features a professional photograph of the product that consumers will find inside the package.